We've been following a story first reported by Roger Cicala of US camera hire company LensRentals on DP Review, who says he had to return some samples of a batch of Canon EOS 750D/Rebel T6i and 760D/Rebel T6s cameras due to defects in the sensor unit. This sensor issue affects specific examples of the Canon's new 750D/T6i and 760D/T6s models. These took the form of sensor spots across the whole sensor area – but these were within the multiple layers of the sensor stack and not on the surface. The spots are not immediately visible but can be seen with an angled light. This photograph of Rebel T6 sensor spots was taken by Roger Cicala of US company LensRentals, who first reported the issue. Like regular sensor spots, it seems they become more prominent in images taken at small lens apertures – this increases the depth of focus at the sensor plane and makes out-of-focus spots on the sensor, or in this case within it, become more clearly defined. This story has been widely circulated since Cicala first reported his findings, but now Canon has made it official with a 'proactive' Product Advisory Notice on its US website. 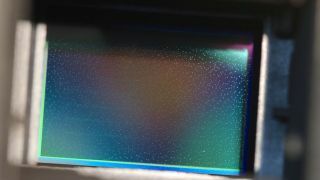 Canon says the fault is caused by 'optical irregularities' within the sensor design and confirms the appearance of 'dark circular patterns' under 'certain shooting conditions'. NOTE: If the battery cover contains the marking illustrated below, the camera is NOT affected by the phenomenon described above even if the first and second digits of the serial number are of the numbers mentioned above. Canon's Product Advisory Notice includes this photograph of the identifying marker on the battery door. Canon says affected cameras will be inspected and repaired. This information is for Canon US customers. Canon owners in different territories should check with their local Canon Customer Support Center. We've just posted our own hands on reviews of the EOS 750D/Rebel 6Ti and 760D/Rebel 6Ts cameras and saw no obvious evidence of sensor issues with our samples.